Jack Bannon - Call on Dolly! John James “Jack” Bannon is an American television actor. He is most famous for his role as Assistant City Editor Art Donovan on Lou Grant, a role he played for the duration of the series, from 1977 until 1982. Bannon’s parents were film and television actors Jim Bannon (Red Ryder) and Bea Benaderet (Burns and Allen, Petticoat Junction, The Beverly Hillbillies, and The Flintstones). Bannon is married to actress Ellen Travolta, an elder sister of John Travolta. They live in Coeur d’Alene, Idaho. Jack started out as a dialogue coach for Petticoat Junction and Green Acres and picked up some jobs at the time, took a lot of classes, studied a lot, and picked up small parts here and there. He lived in New York for a while. Jack mostly worked out of New York on army films and various gigs like that. He questioned why he was living in New York. He never got “in step: with New York. It was very difficult for him. There were too many people and too much stimulation. He went back to California, worked for a while, and was very lucky to eventually land on a show called Lou Grant which lasted five years. It was a wondrous time with an incredibly talented group of people, actors, writers, crew, everybody. After that, he did a short life series called Trauma Center starring a friend and a wonderful person, Jim Naughton. Jim is a two time Tony winner. He won his first Tony Award for Best Actor in a Musical in 1990 for City of Angels. In 1997 he won a second Tony Award with his portrayal of lawyer Billy Flynn in the musical Chicago. Trauma Center didn’t last very long but it was fun while it did last. After that, he went from pillar to post. He would take a job here and there. He was a very lucky person in this business. It is not the easiest to make a living in. He managed to do it. Thanks to his union affiliation, he has a pension. He and Ellen moved to Coeur D’Alene about twenty years ago. Thanks to artistic director, Roger Welch, both have had great opportunities to play great roles at the Coeur D’Alene Summer Theater, which puts on incredibly wonderful productions each summer. A favorite role that Jack played was Henry Higgins. eighteen and twenty pieces which is kind of unheard of these days. Most theaters have, unfortunately, resorted to taped music or synthesizers. Hearing a live orchestra is like walking into a bedroom with fine carpeting and you are barefoot! A good pit is just a cloud to walk on. It is incredible. Jack did two productions of Hello, Dolly at Coeur D’Alene, both with wife, Ellen Travolta. The productions were ten years apart. Roger Welch simply desired Ellen to play Dolly. Ellen thought about it and thought, “Wow!” To play a part like that is pretty spectacular. It is also scary. It was Roger’s interest in doing this that was the catalyst. Ellen nor Jack ever said or thought, “I’d dying to do this show.” People often ask, “Is there a show you would really like to play?” There are some actors who will answer, “I’ve always desired to play Hamlet!” Jack has never said that, either! He has just had wonderful things put in his path. It never would have occurred to him to play Don Quixote. He had heard Richard Kiley do it and it was perfect. Jack had an opportunity years ago to star as Mister Roberts in a wonderful theater called The Westport Playhouse and also in Kansas City, which they didn’t do. When his agent called him to offer him the job, his first response was, “Why would I do that?” His agent said, “What do you mean?” Jack responded, “It’s Henry Fonda! He is the quintessential Mister Roberts! !” His agent told him that other people had played that part since then and asked if he would like to know who was directing it. When Jack found out that the director would be none other than Josh Logan he said, “Where do I be?” Joshua Logan is an icon in American theater. Jack got to do Henry Fonda’s part in Mister Roberts in St. Louis in a wonderful thousand seat in the round theater. There wasn’t an empty or bad seat! They opened the night that Henry Fonda died. It was quite an incredible experience. For the two and a half hour journey of Dolly, Vandergelder discovers things about himself. He is confronted by a woman who is quite stunning and special. He doesn’t see it at first but comes to see it. He stops seeing himself and sees somebody else. It is important in life to be able to see other people and not just one’s own self. The lesson that Horace learns is that it’s “right in front of you.” When he stands there and says, at the end, “Wonderful woman”, he AND the audience gets it. It was right in front of him for the entire play. His thought is, “It takes a woman to joyously clean out the drain in the sink and for dumping the ashes.” He also treats his employees like garbage. He is not a very happy guy. All of a sudden, this woman comes into his life and at the end he says, “I don’t need you to find a woman for me. It’s you, damn it.” He begrudgingly says that but that IS the lesson that HE has learned. Barbra Streisand played Dolly at 26 and she is one of the greatest talents ever. Jack, however, feels that she was a bit young for it. Walter Matthau was older. Jack did enjoy the movie. It is visually and aurally stunning. He feels that an actress should be of a certain age to play this role. That being said, some actresses have incredibly qualities and oftentimes we are fooled. Jack doesn’t know if he would do anything differently if given the opportunity to play Horace again. Circumstances and who one plays opposite have a bearing on the eventual outcome. Both contribute to an actor doing different things. Jack remembers years ago working with Ed Asner on Lou Grant. Jack had to do a scene with Ed Asner in which he had to laugh a lot. The actor playing Animal, Daryl Anderson, asked Jack if that was difficult. Jack said, “Not with Ed. Look at him and pay attention. He does half the work for you.” Playing opposite a different Dolly will elicit different responses. Jack and Ellen have been married thirty-five years as of this writing. That’s a lifetime. 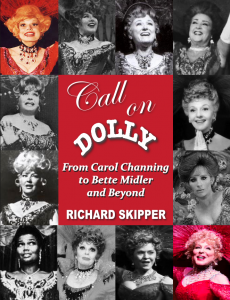 The lasting impact of Hello, Dolly is far reaching. Look at the number of people who mimic Carol Channing! People throw out a line here and there and it is an “impersonation” of Carol Channing. She was HUGE! She has performed for a LOT of people. That show is sweet. It’s about loving people and learning. Ellen sends Jack on Tuesday night to rent movies. His choices are one movie after another of people being blown up, or raped, or killed, or maimed; Hello, Dolly is the antithesis to all of that. Look at It Only Takes a Moment! There are so many wonderful songs that Jerry Herman wrote for that show. Jerry’s music is so touching. Another favorite of Jack’s is La Cage Aux Folles. They also did a great production of that at Coeur D’Alene. Not being in New York, Jack is out of touch with the current Broadway scene. He has no idea who would make a great Dolly. Because of his friendship, he knows Kelli O’Hara. She is married to Jim’s son. She is pretty young. He feels that the actress playing Dolly should be a little earthy. Kelli is certainly that. She has a certain Mother Earth quality. She is very loving. Jack never saw Carol Channing play Dolly. Beyond Ellen and Streisand, he has only seen Dolly portrayed in small theaters. Prior to their first production of Dolly, Ellen, Jack, and Roger went to Portland to see a local production. He doesn’t know the name of the actress but she was very good and it was a good production of it. The production values, however, weren’t that of a Broadway production. Jack recalls going to see a production of Beauty and the Beast when the theater was contemplating doing it. Roger was with them. The scene opened on the library and Roger literally gasped. Jack said, “Well, Roger, if you had three or four million dollars, you could have a library instead of a painted backdrop!” When Jack saw Jim Naughton in City of Angels, the sets for that show were unbelievable. They were coming in and out and up and down, it was a breathtaking show. Jack saw it seven times! Jim took the show to California and Ellen took Jack to see it there as well for Jack’s 60th birthday. Then it moved to the Shubert and Jack saw it several times there. The lines are blurred between Dolly and Ellen. Their granddaughter Lola Rose remarked about it with Ellen. She said, “Grandma, you like to put your hand in everything like Dolly, don’t you?” Ellen answered “yes”. She likes to control certain things like Dolly Levi. She likes to be in control. Actually, during the course of the play, she is not always in control. She is still trying to get it back as she says in Before the Parade Passes By. Horace Vandergelder kind of throws her off a bit. Having a guy in her life has not been the norm for several years. Krista Kubicek played Irene Molloy and sang Ribbons Down My Back and the audience cried. It was sang so beautifully. Irene says to Minnie, “Horace will never be another Peter Molloy. He has money and all that. He’ll do.” With Dolly, it is more than that. He will do much better than just do. He’s a good person who doesn’t know it yet. The closing night was not unique beyond being another sad night. It’s always bitter sweet. At Coeur D’Aline, they only get to do between twelve and thirteen performances because it is what it is, four plays in the summer. Every win is a loss. Every time an actor gets a job, they know it’s going to end. There is almost always sadness about that. Jack gets terrible postpartum blues from the theater at times because people leave. In the old days, actors used to strike the set, too. It’s rare that that is the case in professional theater anymore. They would play the show on a Saturday night and then either late after the show or next afternoon, they would be ripping the sets out. It’s like ripping their hearts out or ripping an arm off. Then, the actors sometimes go back to the theater where they played the night before and everybody is gone. They have left town, they have gone back to Seattle, New York, Los Angeles, Portland, or wherever they come from. They have returned and there is nobody there anymore. It hurts when something is over, especially when you loved it. Jobs are sometimes hard to come by. Why does Jack do what he does? When it is done well, it feels better than anything. He loves the people. Hello, Dolly was a great opportunity for Jack to play opposite his wife, Ellen Travolta, and it was a fun experience. He will always remember standing stage left, he was off stage actually, and watching Ellen standing alone on stage right and singing Before the Parade Passes By and turning a song into a poem. As stated above, it was more than a song and it is a great song!